Sedona Vacation Rentals, Arizona Vacation Rentals. 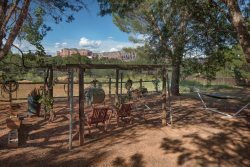 An Oasis in the Heart of Sedona! Beautiful custom built home with Views on. 1.5 acres. Minutes from trails, restaurants and shopping yet has an intimate and private feel to the entire property. Enjoy gazing at the Red Rocks of Sedona while relaxing around the custom built fire pit or relaxing in the pool. This gem will not disappoint! Enter through a beautiful custom copper front door with rose bushes lining the Chattahoochee walkway, into your own private oasis in the heart of Sedona. The front court yard includes new landscaping, a recently redone pebble tech salt water pool, custom gas fire pit with granite and upscale outdoor kitchen. Outdoor kitchen includes electric outlets, natural gas 42'' high end Twin Eagles grill with double side burner, paper towel holder and 4 doors for storage with granite counter tops and spotlights on Diadora trees. Court yard area is surrounded with brown aluminum & vinyl fencing, upgraded to ''Puppy Picket'' to keep the critters out, adds extra privacy. Kid friendly and outfited with a crib, high chairs and toys. Pool is seasonal and is not heated and not available to be heated.